The mesh generation in the standard BEM is still not trivial as one may imagine, especially for high-dimensional moving boundary problems. 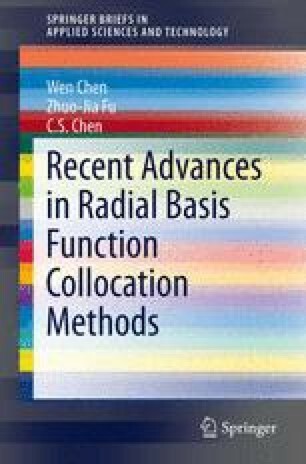 To overcome this difficulty, the boundary-type RBF collocation methods have been proposed and endured a fast development in the recent decade thanks to being integration-free, spectral convergence, easy-to-use, and inherently truly meshless. First, this chapter introduces the basic concepts of the method of fundamental solutions (MFS). Then a few recent boundary-type RBF collocation schemes are presented to tackle the issue of the fictitious boundary in the MFS, such as boundary knot method (BKM), regularized meshless method, and singular boundary method. Following this, an improved multiple reciprocity method (MRM), the recursive composite MRM (RC-MRM), is introduced to establish a boundary-only discretization of nonhomogeneous problems. Finally, numerical demonstrations show the convergence rate and stability of these boundary-type RBF collocation methods for several benchmark examples.